The worst part about summer is bathing suit season, but the glass-half-full perspective is that the best part about bathing suits is the summer season :) And although I've always hated the idea of shopping for (let alone wearing) a bikini, the advent of the cute one-piece and high waisted bottoms have made the whole experience much less painful. I don't know if it's just my memory failing me, but what seemed like racks full of skimpy triangle bikinis and unstylish tankinis from my youth have been replaced by a wide range of styles to flatter and satisfy all sorts of body types and preferences. I love perusing the options with a discerning eye and high bar in order to find one or two that meet all my requirements. Trust me—they're out there! That's why I've scoured the internet and rounded up a whole bunch of my favorite one-pieces (40 to be exact! and each image is linked to its source), the vast majority of which are from stores with generous shipping and return policies for at-home trying, trying, and more trying. It's important to note that some of these picks are more expensive than what I typically like to spend on clothes. 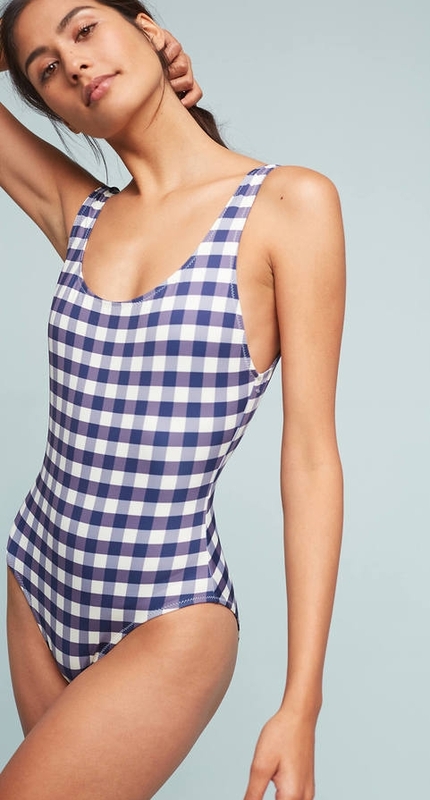 But over the past couple of years, I've come to believe that when it comes to bathing suits, sometimes a higher price tag is well worth it if it means feeling more confident and secure. Plus, a good suit should last a few seasons, and the average person really only needs one or two. 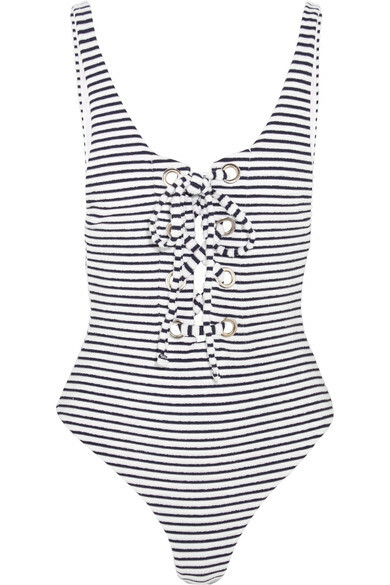 If I'm willing to invest in a good winter coat to stay warm, then I should be willing to invest in a quality summer swimsuit that I'm comfortable in. **Update, I've now tried on (left to right) #4, #6, #10, and #40 below, so I thought I'd give a quick review. #4 was high quality and pretty flattering for being a white suit (it just didn't camouflage much so that's why it ultimately wasn't a keeper for me). The lace-up back becomes the straps, and it's adjustable in that way. #6 was a very cute and comfortable suit (no sharp or tight seams which I love) but on both myself and my petite friend, it was way too low cut, as if the straps needed to be shortened, but when you pull the straps tighter to mimic shortening them, the suit is no longer form fitting in the front and rather flat from stomach to chest. #10 was practically a thong so if you're into that, this suit was otherwise incredibly flattering as it's a thicker terry cloth material and very chic.